← Hey, look! It’s a sideblog! Life for our anti-hero seems to be going the same as before he gained the Death Note, except that now Ryuk is bugging him all the time. 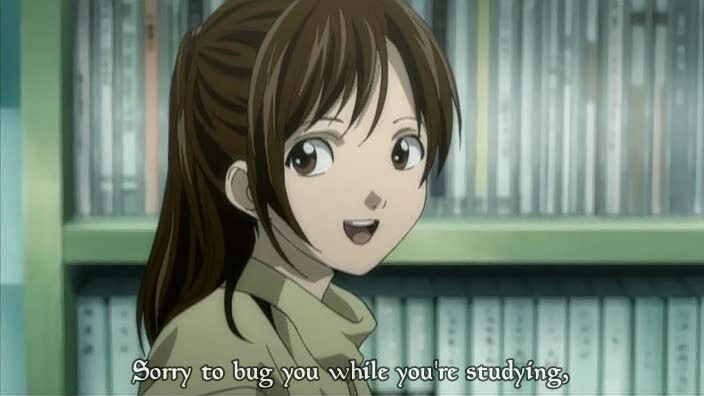 After Light’s sister comes into his room and Ryuk tells him anyone who touches the Note will be able to see him, Light decides to hide the Note under a false bottom and sets up an fiery trap. Meanwhile, the world’s police organizations take notice of all the prisoners coincidentally dying of “cardiac arrest” and call on L for help. 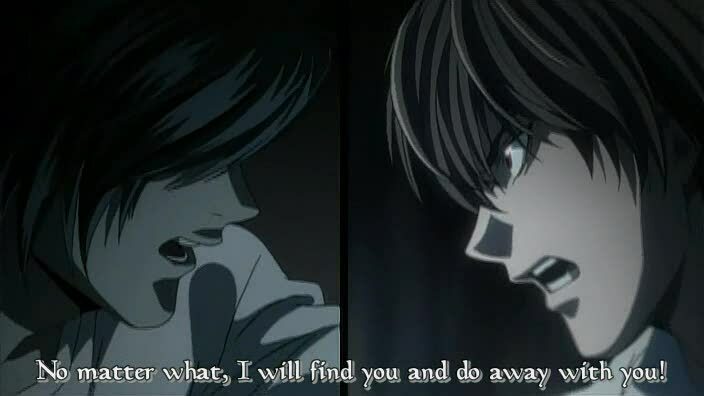 Light talks to Ryuk about the websites and worldwide fame that he, under the public’s name “Kira”, has garnered through his murders of felons. 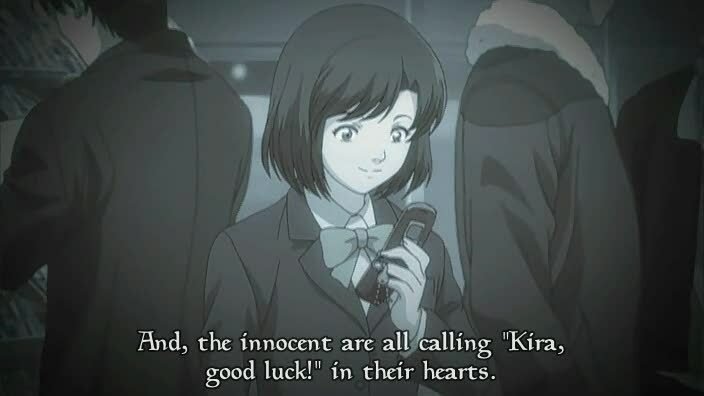 All of a sudden, television broadcasts are interrupted by a special bulletin of L calling out Kira on the air. The face on the screen is of Lind L. Tailor, a criminal scheduled to be executed that day. Light foolishly kills Lind and thus allows L to confirm his hypothesis that Kira lives in Kantou, Japan. The cheers of “Kira, good luck!” from the common folk reminded me of the film Natural Born Killers, in which people rooted for the serial killer couple as they made their way across the country. Man, that was a weird movie. Anyway, it’s interesting how a faceless person can capture the public’s attention; other examples from anime that come to mind include Shounen Bat (Paranoia Agent) and the Laughing Man (Stand Alone Complex). Light’s younger sister looked cute and it seems kind of sad to me that she’s not going to show up very often. Watari, L’s assistant, had a nice deep voice. L himself sounded good whenever the camera angle forced his voice to be heard naturally and not through a masking filter. That “I-know-something-you-didn’t-think-I-knew” voice that reminds me of Shin’ichi Kudo and his smirk when outlining who murdered whom and how they did it. 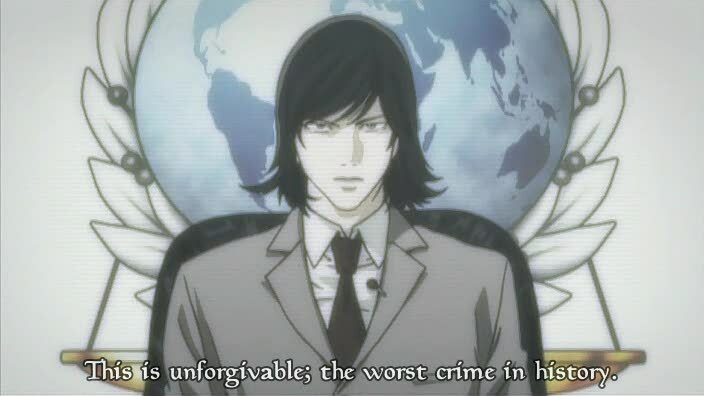 This entry was posted in Anime, Death Note. Bookmark the permalink. Pingback: Death Note Ep.2 « slug mode, on!